That was the verdict delivered by a Labour voter on the community website ‘Hedgeendpeople’ on the news that Eastleigh’s re-elected MP Chris Huhne had negotiated himself a position in the Conservative cabinet as Energy Secretary. Faced with defending a majority of only 568, Eastleigh’s Liberal Democrats had campaigned hard to encourage tactical voting among the 10,000 voters who had supported Labour last time out. Claiming Labour could not win in Eastleigh and that only a Lib Dem vote could prevent a Conservative government, they were able to increase Chris Huhne’s majority by almost 4,000 votes reducing the Labour vote by a similar amount. 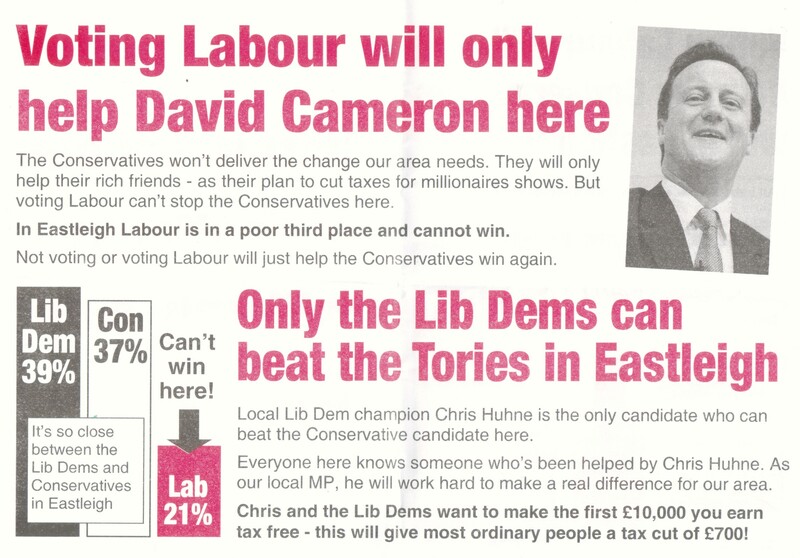 Even the Labour Party supporting tabloid ‘The Daily Mirror’ had urged Eastleigh’s Labour voters to back Chris Huhne. 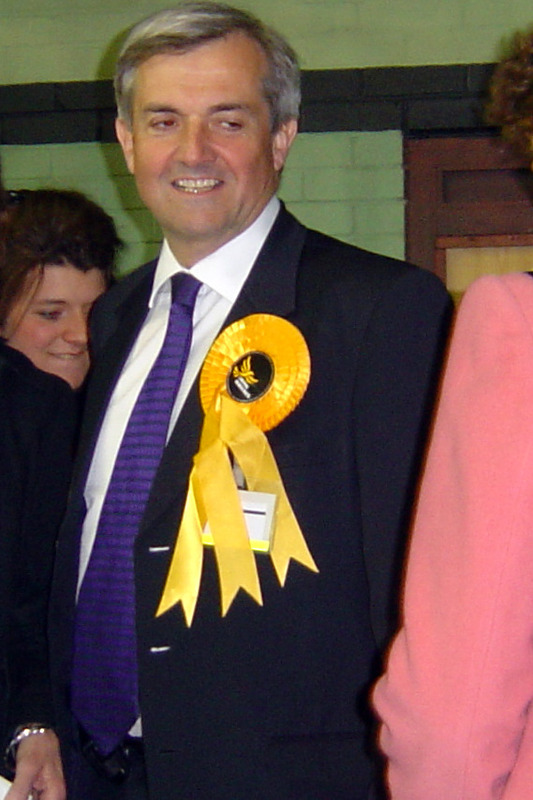 During the course of the campaign Gordon Brown and cabinet ministers Lord Adonis and Ed Balls had also made statements in support of tactical voting and there seemed to be the general expectation that in the event of a hung Parliament there would be what Kevin Maguire had referred to as a ‘progressive alliance’ between the Liberal Democrats and the Labour Party. However, in the event, the alliance formed was between the Conservative Party and the Liberal Democrats with Mr Huhne as a key negotiator. “I have had complaints from Labour supporters spoken to by Chris Huhne – who told them they were wasting a vote if they voted Labour. “Many of us saw that voting Liberal Democrat was a viable alternative to Labour. That your party held high the morals and aspirations of us Labour voters. That you were not a mini Tory party which is out to conserve and protect the status quo which is heavily canted against the working man and the socially deprived classes. Lib Dem supporter and local activist Sam Snook said although he wasn’t happy with the Liberal Democrats being in a coalition with the Conservatives he would still vote Lib Dem. How do you view the new coalition government – a hasty marriage of convenience or the dawn of a new era in British politics? As a life long Labour voter this last general election was surrounded by a composition of many elements which made it an ‘odd one out’ by my book. I considered my choices both long and hard before making it. I had always been happy to vote Labour and support them at grass roots but, to be honest, this incarnation of the Labour Party, had swung so far to the right that I have begun to feel let down. It still does represent my Christian, caring outlook on life, it does look after the socially deprived but there was a jaded look about them in Government. I wanted them revived and I felt that with a Lib/Lab pact this could be achieved. I decided to vote for Mr. Huhne who, co-incidentally, I met as he was canvassing locally. We spoke briefly and I stressed that many of us Labour voters were going to place our trust in him. Mine was not only for the previous reasons but also to attempt to repell a Tory landslide. Friday 7th May was, for me, a good result as the Tories had not swept to victory and it appeared there would be a coalition although I understood that the Tories should seek to form a Government. I am desperately disappointed that Mr. Huhne seems to have forgotten the words of Labour voters here in Eastleigh. Not only that but he has compromised his principles on Europe, Trident etc just for a seat in the cabinet. Mr Huhne now has to continue horse trading at every turn with a party which has many dissimilar outlooks to his party’s and one that still cannot be trusted. When this house of cards tumbles, as I feel it will, he will return to Eastleigh for a further mandate from the electorate. I’m not so sure that he will have the support of the Labour voters and we, who voted tactically, will probably return to the party which we know cares for the working man. The Labour Party. Our candidate may well not get elected bur neither might Mr. Huhne, so that may leave both iof them looking for proper work after the next election. Well perhaps now the penny has dropped with the Labour supporters that tactically voted Lib Dem. What the Lib Dems tell & what they actually do are two different things. Conservative leaflets kept telling the electorate that the Lib Dems were misinforming and misleading you, seems they were right. I am sure this coalition will not last, as pressure will be put to on the Lib Dem Leaders by their party faithfully, and we will have another general election very soon. This time I am sure Mr Huhne will loose, as he has now shown his true colours… in it for Number One!! Chris Huhne has NOT betrayed Eastleigh Labour voters. He has HELPED them! Imagine if the Tories had formed a government WITHOUT LibDem moderation! Eastleigh’s Labour voters would have no doubt felt the impact! Besides SURELY Chris Huhne fought this Election in the belief that IF a HUNG PARLIAMENT arose, there would be a Lib-LAB coalition not a Lib-CON coalition. He probably anticipated a Cabinet position but could never have imagined it would be under Slippery Dave. Eastleigh should WELCOME Huhne’s promotion under Slippery Dave just as it would have welcomed it under Gordon Brown! It markedly INCREASES Eastleigh’s influence! IF he DOES have to spend less time in this Constituency, then this will be more than offset by his ability to get things done on our behalf behind the scenes (which is where most of the action really takes place). The fact that he TEMPORARILY has to endure working with Slippery Dave until the next Election is no doubt an embarrassment for him at the very least. No doubt SOON we will all be receiving a detailed explanation about his decision. I have spoken to people of all political colours who say that in the past, Huhne has helped them as Eastleigh’s MP. Why should his commitment to Eastleigh’s Labour voters be any less now that he is in a Cabinet headed (at least for now) by Slippery Dave? Surely you know the politician Huhne is. Is anyone suggesting he is radically different to any other MP? Ok, he is SERIOUSLY misguided about the EU in my opinion, but his commitment as an MP cannot be doubted. Casting aside political bias for a moment, I can’t recall an MP who has worked so hard at promoting himself. Credit where credit is due! As a matter of interest I believe he will the next LibDem leader and this will happen sooner than you think! As for this coalition, how long do you think it will last? Behind the scenes Tory backers, MPs and members are FURIOUS about this 4th successive defeat. They needed 20 more seats to form a government and UKIP cost them those seats. There is no doubt that had UKIP not stood, the Tories would have won! If you also include the BNP impact, then the Tories are now fatally damaged. The split over Europe has been papered over for this Election but get ready for TRUE CONSERVATIVE REVOLT! They MUST either commit to an in-out referendum or outright EU withdrawal or they will never win another Election. Don’t recall UKIP getting any seats in the commons AGAIN! Despite what some have called a Dad’s Army effort, UKIP SPLIT THE TORY VOTE to devastating effect in 24 TORY MARGINAL SEATS according to my calculations. Dr Richard North calculates slightly more than this. So while it is true to say that UKIP didn’t get a single seat in Parliament, it certainly stopped 24 so-called “Conservatives” getting in. Conservative voters are shutting their eyes to the appalling truth! Despite spending more than £80 million on this election, the Conservative Party has suffered a historical 4th General Election defeat at the hands of a Dad’s Army pressure group. Never before has this happened. It is a damning indictment of Tory leaders’ treasonous support for Britain’s annexation by a FOREIGN POWER (the EU). Graham! I take it you voted “Conservative”. Do YOU support foreigners governing the British people? Do you support open borders and mass immigration of cheap EU labour? Do you support the EU-Turkey trade deal which has devastated Ford – the most important manufacturing industry in the South of England? Do you support cheap EU goods flooding into Britain and our not being able to put tariffs on them? Graham! If you do support all this, then carry on Conservative. If you think all that is appalling – as I do – and as at least 900,000 other Brits do – then change to UKIP! It’s the only message those treacherous dogs who have taken over my former Party (the Conservative Party) will ever understand. If you carry on supporting them, they will carry on sticking two fingers up at you behind your back. Peter,you are a Europe loving Lib Dem.Come on ,admit it!